This Game is inspired by the ‘Give- and Take Matrix’ mentioned in the book ‘Game Storming’ and was initially inspired by techniques used in engineering, chemistry and design. Agile Wall Street works for TeamBuilding, motivation, diagnostic of flow and energizing your Team. I adapted it a little bit to my requirements and it can be used for TeamBuilding, Motivation in Teams and also for Retrospectives. I just call it ‘Agile Wall Street’. It is a diagnostic tool and helps players explore value flows through the Team or a Group. Create a Matrix as shown in the following Picture. Make sure you have the same count of rows and columns – one row and one column for each Participant. Let every Participant write down her Name on a large StickyNote, two times and put them on the Matrix as shown. Make sure to post the Names vertical and horizontal in the same order! Now, ask all Participants to write down their Motivation of beeing in the current Team on a large StickyNote, take a new colour for that. Let Participants post their Motivation-Note along the diagonal, where every Individual intersect with themselves. 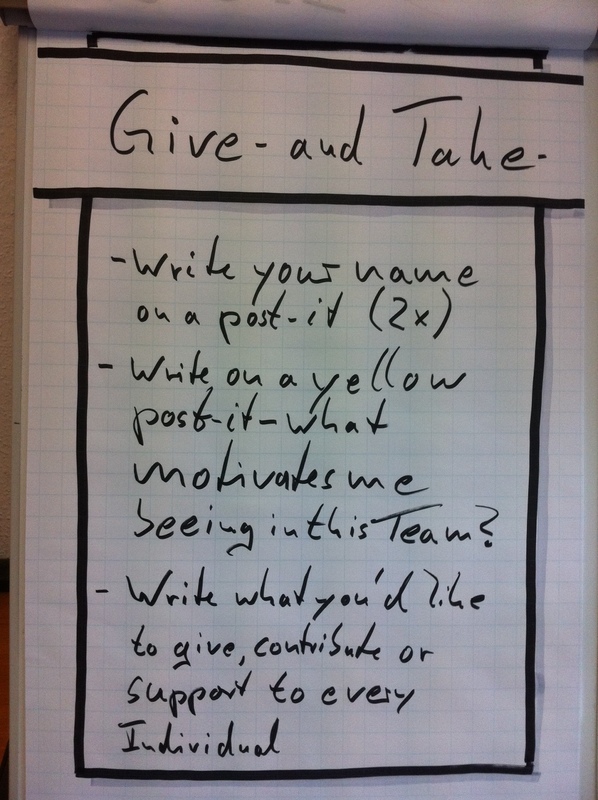 In addition, call the vertical ‘Give’ and the horizontal ‘Take’. Give Participants a short moment to choose the first TeamColleague they want to start with. Each Participant can start with any other TeamColleague she would like to start. Give a Timebox of 5 minutes! After finishing for the first TeamMember, ask the Participants to continue with the next TeamColleague, answering the same question on a StickyNote. Again provide a TimeBox of 5 minutes. Let Participants repeat until everybody has an personal offer for all other TeamMembers. When the Matrix is completed ask Participants to have a seat. Now you start to facilitate the ‘Wall Street’ offers. Start with the first TeamMember from the horizontal. This Person should listen carefully what her TeamColleagues want to offer, without commenting. Ask all other Participants, one after another, what they want to offer to this Person and let them shortly explain what they have written down. After all offers are explained to a Person, ask her how she feels right now. Probably this Person will have a smile on her face and just feels good. Repeat this until all TeamMembers have introduced and explained what they would like to offer to their TeamColleagues. After this exercise the whole Team will be enrgized and TeamMembers will follow up to the offers they received self organized. If the Team agrees you can put the Matrix somewhere in the Team room.